specific forms of rosacea . !After the treatment, patients must observe the doctor’s instructions. The medical use of DERMAPEN® is a viable alternative to laser skin rejuvenation without involving a very costly or invasive procedure. Treatments are painless and have a short recovery time! All the components used in a micro needle treatment are non-invasive for the skin and no side effects are known to this treatment, unlike other types of therapies. Dermapen offers one of the best and accepted facial rejuvenation therapies, as it does not use chemicals and has a short recovery period. The needles are cut in a special shape, patented (micro-lesions caused by such needles close more rapidly), in order to offer the safest medical treatment without causing pain to the patient. All components used in a Dermapen® treatment are non-invasive to the skin and no side effects of this treatment are known, unlike other types of therapies. How does the Micro-Needling Dermapen system work? 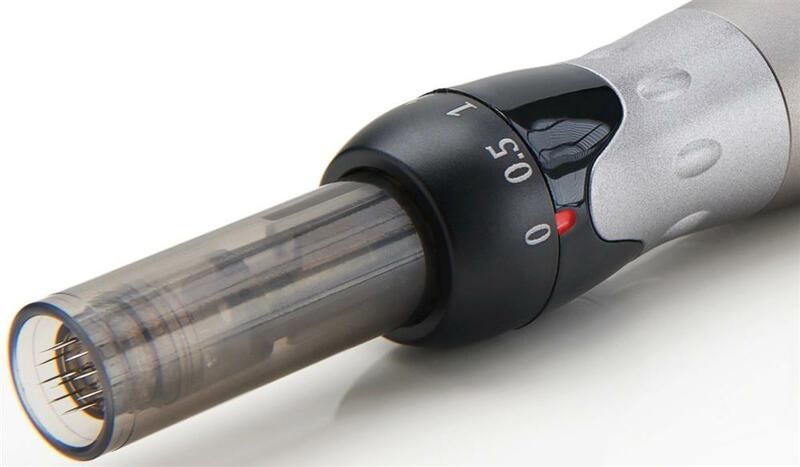 The Dermapen® system employs sterile needle cartridges, individual for the optimum safety of each patient. Thanks to the vibratory vertical system, the needles penetrate the skin vertically to adjustable depths, generating micro channels and stimulating the natural healing capacity of the body by producing collagen and elastin. Treatments customized by the function of adjusting the length of needles according to the condition (deep post-acne scars or fibrous scars), and depending on the area treated (periocular). Non-chemical treatments with rapid healing and short recovery times. Accelerated cellular regeneration by facilitating the penetration of growth-rich or amino acid-rich sera that stimulate fibroblasts (the key cells in the dermis that synthesize collagen) and nourish cells from the dermis, stimulating tissue regeneration. Due to the system used, absorption of active substances can increase up to 3000% compared to traditional application. “Damage” produced by needles is minimal, without affecting the healthy part of the tegumen, which can not be said about other techniques of skin rejuvenation (laser, peeling, etc.). HOW DOES THE THERAPY BY MICRONEEDLING WORK? The therapy by micro-needles is based on the body’s self-healing mechanisms. Your body reacts to the insertion of needles the same as it reacts to any other object that pierces the skin. The insertion of very thin surgical needles is perceived by the nerve receptors as a stimulus. The needles are so smooth, that the skin lesion is undetectable – the epidermis remains almost intact. In exchange, this nervous stimulus turned into electrical signals initiates a “waterfall” healing process. Skin cells around the channel made by stinging frees growth factors for undifferentiated cells that multiply, form new cells, fibroblasts that will produce more collagen and elastin fibers. Fibroblasts’ task is to migrate towards the lesion in order to heal it (close the wound, repair it with collagen and elastin fibers). The channels occurred by stinging close very fast, within 1-2 hours, without needing special interventions. The transformation of undifferentiated cells into cells necessary for healing is an automatic process, like a one-way road; the final mission of the process is to form new collagen fibers that will integrate between the collagen fibers existing in the superior derma and which will „fill in” the atrophic scars. The effect is cumulated and a new collagen layer forms; this process is called neocollagenegenesis. Endothelial cells coating blood vessels on the inside (especially vessels in the capillary veins) are stimulated to multiply, which generates the formation of new capillary vessels that will transport more blood into the skin to better oxygenate and feed it. This process is called neoangiogenesis. Obtaining of better results in combination with the medical treatment. The DERMAPEN® may create up to hundreds of thousands micro-channels in the skin in only 10 minutes, at a depth between 0.5 and 2.0 mm, thus allowing the use of active ingredients from skin care products (mesotherapy products, growth factors, hyaluronic acid, etc.). Thus, the absorption of skin care products may increase up to 3000%, compared to the traditional application. At the same time, the „damages” caused by the micro needles are minimum without affecting the healthy part of the tegument, which cannot be said by other skin repairing techniques (laser, peeling, etc.). As the epidermis remains intact, the recovery period is very short, and the stimulated production of collagen is directed towards the improvement of the texture and quality of the tegument. Schedule now for a last-minute treatment with DermaPen!